How do we describe what other people are like? What are the major characteristics that we can use to describe the personality of friends and strangers? As far as we know, these questions has been discussed since the emergence of ancient civilizations in Greece, India and China. In modern psychology, starting with Gordon Allport, a more or less sharp distinction has been made between values - that is motivational goals important for people in their lifes - and personality traits - described as behavioural consistency across situations. The study of values has flourished in social psychology and the study of personality traits has been a core area of research of personality psychology, with little discussion of the overlap or convergence between the two approaches. Diana Boer and myself were intrigued to test the similarities of these two approaches. We were inspired by newly developed neural network models of personality that conceptualized personality as expressions of basic motivational goal systems. If personality traits are expressions of motivational goal systems, we should see some systematic relationships with values. Furthermore, we were aware of a number of studies that have found quite variable associations between values and personality traits in the Big Five tradition. If there is some systematic association, as we presumed, why should there be such variability in empirical studies? We set out to address these two broad sets of questions in a paper that is appearing in the Journal of Personality. We collected all the studies that have reported correlations between any set of Big Five instruments with the circular value theory described by Shalom Schwartz and conducted a meta-analysis to identify the overall patterns that might be obscured in individual studies. Let us first quickly review personality traits and values. Openness to experience: (inventive/curious vs. consistent/cautious). Appreciation for art, emotion, adventure, unusual ideas, curiosity, and variety of experience. Openness reflects the degree of intellectual curiosity, creativity and a preference for novelty and variety a person has. It is also described as the extent to which a person is imaginative or independent, and depicts a personal preference for a variety of activities over a strict routine. Some disagreement remains about how to interpret the openness factor, which is sometimes called "intellect" rather than openness to experience. Conscientiousness: (efficient/organized vs. easy-going/careless). A tendency to be organized and dependable, show self-discipline, act dutifully, aim for achievement, and prefer planned rather than spontaneous behavior. Agreeableness: (friendly/compassionate vs. analytical/detached). A tendency to be compassionate and cooperative rather than suspicious and antagonistic towards others. It is also a measure of one's trusting and helpful nature, and whether a person is generally well tempered or not. Neuroticism: (sensitive/nervous vs. secure/confident). The tendency to experience unpleasant emotions easily, such as anger, anxiety, depression, and vulnerability. Neuroticism also refers to the degree of emotional stability and impulse control and is sometimes referred to by its low pole, "emotional stability". Shalom Schwartz' theory of values differentiates at least 10 value types that can be organized into two major higher order dimensions. These two major dimensions are openness to change (individualistic) versus conservative (collectivistic) values on one hand and self-enhancing (dominance) versus self-transcendence (altruistic) values. Individual values can now be ordered in a circular structure along the two dimensions. Moving around the circle, Power (PO) captures the goals of striving towards social status and prestige, controlling or dominating over people and resources. Achievement (AC) emphasises personal success through socially approved standards of competence. Hedonism (HE) values focus on pleasure and sensuous gratification of the sense. Stimulation (ST) captures excitement, novelty and pursuing challenging goals in one’s life. Self-direction (SD) entails valuing independent thought and action. Universalism (UN) values refer to the motivation to understand, appreciate, tolerate and protect the welfare of all people and nature. Benevolence (BE) in contrast has a more narrow focus on preserving and enhancing the welfare of people close to oneself (family and close friends). Tradition (TR) values are focused on respecting, accepting and committing to the customs and ideas of the traditional culture and religion. Conformity (CO) refers to restraining actions or impulses that may upset or harm others and violate social expectations and norms. Finally, security (SE) emphasises values around safety, harmony and stability of society, social relationships and the self. Our basic argument was that values as motivational goals and personality traits as behavioural consistencies should be systematically linked. Using a new method that we developed in a previous article that allows us to track the systematic relation of personality traits to the underlying structure of values (see our previous article), we were able to examine the overall relationship between the two constructs. Agreeableness and Self-Transcendence (positively) versus Self-Enhancement (negatively) values are strongly and consistently related. Agreeable individuals are also very benevolent and they tend to care about others, close and distant alike. Similarly, Openness personality traits were strongly associated with Openness to Change (positively) versus Conservatism (negatively) values. Open individuals also strongly value stimulation and self-direction values. The correlations for these two traits with values were substantive and not significantly different from correlations between different personality instruments measuring the same trait. Hence, for these two personality traits, the relationship with values is strong and values and personality are highly convergent. Extraversion is somewhat more weakly related to Openness values, but also weakly to Self-Enhancement values (achievement and power values). 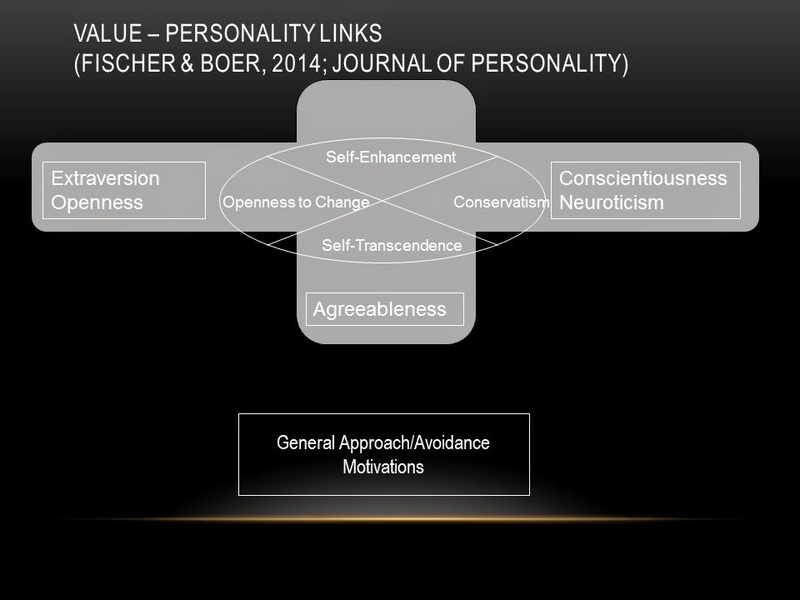 Conscientiousness is related to Conservatism values, but also shows some correlations with Self-Enhancement values (in particular achievement values). These two personality traits correlated significantly weaker with values and there were sometimes notable secondary associations of traits with the other main axis of values. This suggests that these two traits are more complex in their basic motivational structure. Finally, Neuroticism is a stability oriented personality trait and no surprisingly shows some weak associations with values that ensure stability (Conservatism values). This was a really re-assuring and strong pattern overall. By using a holistic approach to values and personality across a large number of studies, we were able to show the overall systematic relationships between these two constructs. But moving to the second main question, how can we make sense of the variations in these correlations across different studies? Here we need to first briefly consider how values and personality traits might be causally related. First, values may provide the motivational structure for humans, that is then expressed in behaviour (personality traits). Assuming this logic, people who value conformity will follow rules and orders with great care. Values come first and actions follow. Second and alternatively, following classic self-perception theory, people might engage in behaviours in relatively consistent ways, which they then interpret in terms of overarching goals and re-interpret as their stable values. E.g., I am always conscientious and follow rules and orders in a consistent way, therefore, I am probably a person who values conformity and tradition. Here, actions come first and values are inferred from these actions in a secondary step. We thought about what may weaken this link between values and traits. Environmental threats should play a major role in how values and personality traits are linked. In highly threatening environments, that is environments where there is poverty, lots of environmental threats such as cold winters and superhot summers, lots of diseases (you can easily get infected and die), little available food, lots of violence and no personal freedom, people are probably quite restricted in their choices and behaviours. Hence, their personal values may not be expressed in behaviours, because the environment determines their actions more than their personal orientations and motivations. Equally, since the environment strongly influences people's behaviour, individuals may not interpret their own behaviour as reflecting some underlying values because their behaviour is more strongly influenced by environmental pressures. Hence the overall link between values and personality traits should be lower, regardless of how values and personality are causally related. We tested this hypothesis using a good number of different indicators of threat. Amazingly, threat turned out to be a strong and consistent moderator for most of the value-personality associations. Hence, our analysis of environmental threat in a broad sense can explain why there was so much variability in the literature previously. It also could explain why researchers have not integrated personality research with value research in a more systematic way. Given the substantive variability, researchers might have thought that the links are too weak and too inconsistent to be worth pursuing. However, we believe we have shown that by taking a broader picture, examining the value-personality link in a more systematic way and examining the conditions in which the links are stronger or weaker, we can move both value and personality research forward. In my view, values and personality traits are expressions of underlying motivational systems that are encoded in similar and overlapping language. It is more of an accident of history that these two systems have emerged in different research fields. I hope this study will help to bring the fields back together and allow a more sophisticated examination of how values and traits are both expression of human personality.